Raise the flag of your Company and hand out a friendly fun-packed gift for children with these Company Colour The Flag for Business Gift and raise your profit margin. 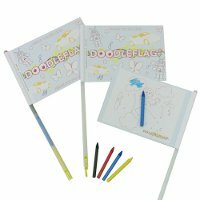 Included with the Colour the flag item are some pencil crayons, so you can fully customise your bespoke print onto the flags ready for children to colour in, and ensure some brand-awareness. These Company Colour The Flag for Business Gift freebies are absolutely brilliant for virtually any retail outlet, circuses, amusement parks, restaurants and more. For a FREE QUOTE, please fill in the form regarding our Company Colour The Flag for Business Gift and we'll be able to help you.